I walked into the mall on Saturday to get my hair done, and was met with Christmas music and decorations, and even Santa! Later, at CVS, there were rows of Christmas candy on display, with fall and harvest decor already 75% off. But why am I surprised? This happens every year. Even though I am working behind the scenes to get ready for Christmas (stashing away some gifts, making my lists of baked goods to freeze ahead of time), I want to celebrate autumn and Thanksgiving first. It seems summer was just a few weeks ago. I don't want to rush things. 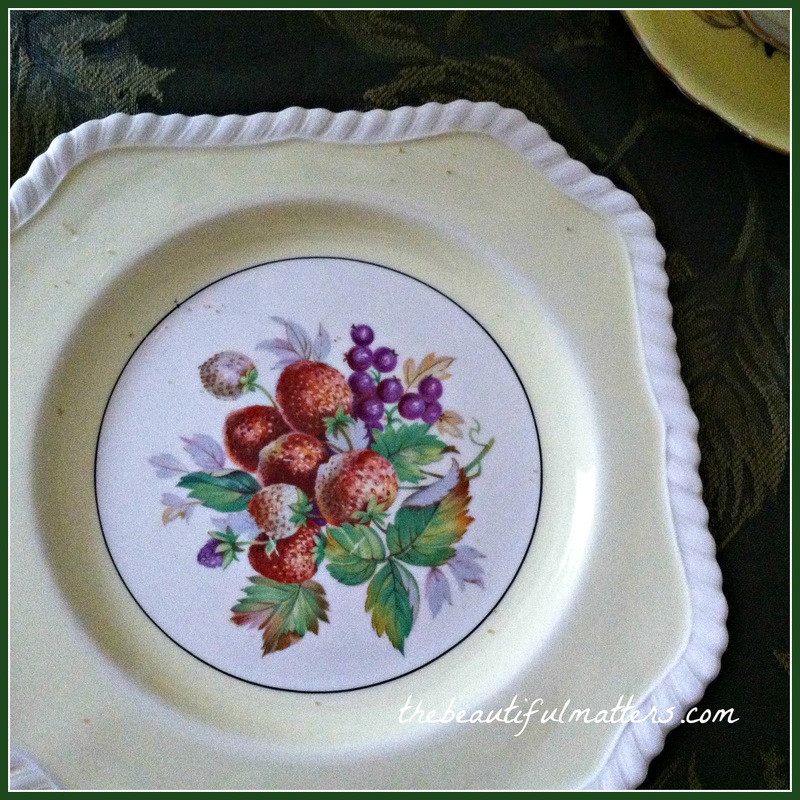 I love a fruit motif on china, and what better way to celebrate autumn harvests? I bought this Fitz and Floyd teapot in the early 90s. I think these Johnson Brothers plates go well with it. I have five of them, four square ones in blue, pink, yellow, and green, and a round one in pink, all with different fruits on them. Oops . . . I see cookie crumbs on this plate! These little almond cookies are like the "windmill" cookies you've probably seen, and are good for dunking in tea. The top cookie is a rooster. I know I was just complaining about Christmas coming too early, but these cookies are sold year round here, and I forget they actually are St. Claus cookies. 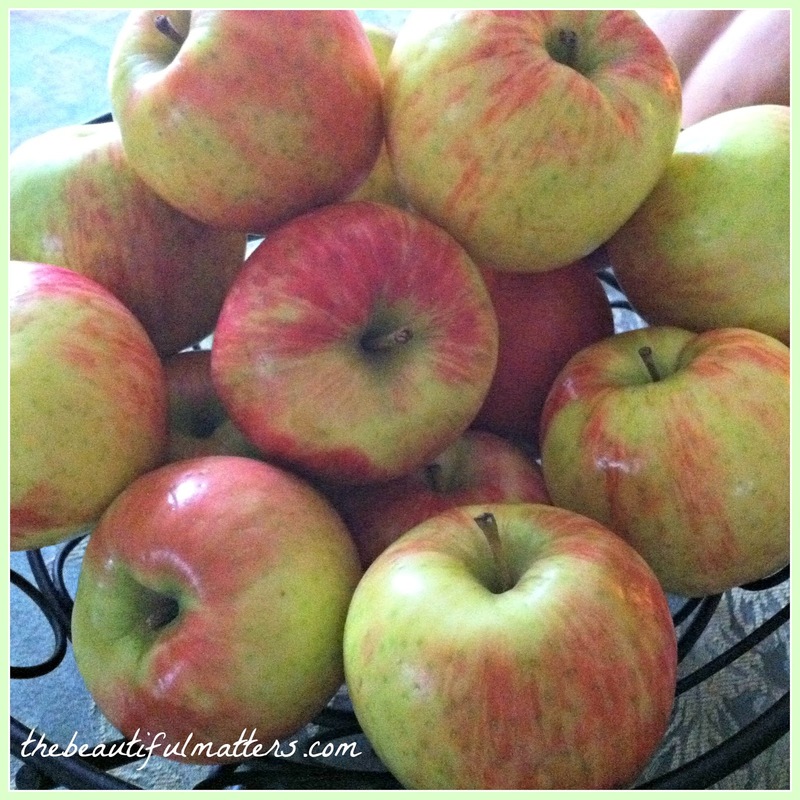 Honey Crisp apples, my favorite. I could eat a couple every day, and sometimes do. Someone was wondering last week if people actually sit down and enjoy the tea parties they post, and I'm here to tell you I do. Mr. Beautiful had one eye on the football game, however. 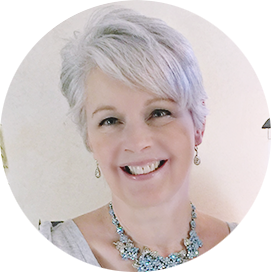 I've been thinking about how to plan for all the guests we'll be having over Thanksgiving and Christmas, and how to truly enjoy and appreciate both holidays and their true meanings. I will be posting my "10 ways to beat holiday stress" later this week. It's more a note to self, a reminder to me; maybe you can share your suggestions, too. Have a beautiful week, friends. Linking with Sandi at Rose Chintz Cottage. I still can't believe that summertime is over. And to think Christmas will be here next month! 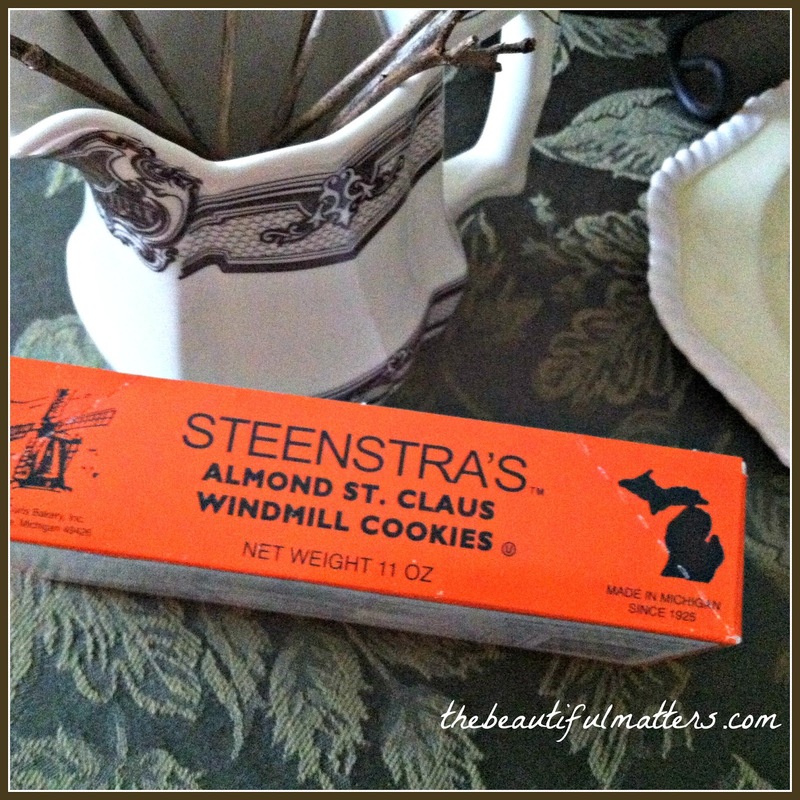 Those "windmill" cookies look perfect for dunking in tea. What a beautiful tea setting, there is nothing nicer than a traditional afternoon tea I am a great fan. They are preparing for Christmas in the shops here too, as soon as Halloween is over, Christmas stuff appears. Thanksgiving is so late this year that I am certain there'll be some co-mingling of holidays. I may even have the tree in pkace. My mother used to do that when Thanksgiving was late. What fun that you participate in your tea party so that it is not merely staged for Blogdom. Win-win! I'm with you Deborah about loving the Fall and not trying to rush it out the door!! 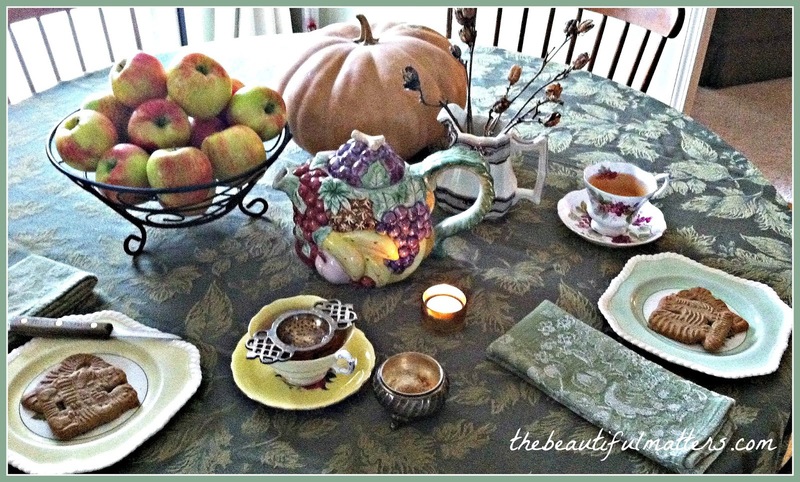 Your Fitz and Floyd teapot is perfect for your Fall tea, but it's those JB plates that having me sighing...ahhhh. I love their vintage look. I'd love to sit and enjoy a cookie and tea with you while Mr. B peeks at the game. He wouldn't mind us talking! Happy Tea Day! Lovely table decor! I am definitely not ready for Santa, snow, and reindeer...let's keep fall (or maybe even summer) around a while longer! Thanksgiving is perhaps my favorite holiday. Your F&F teapot is adorable! I love your JB plates and I have the green and pink ones. 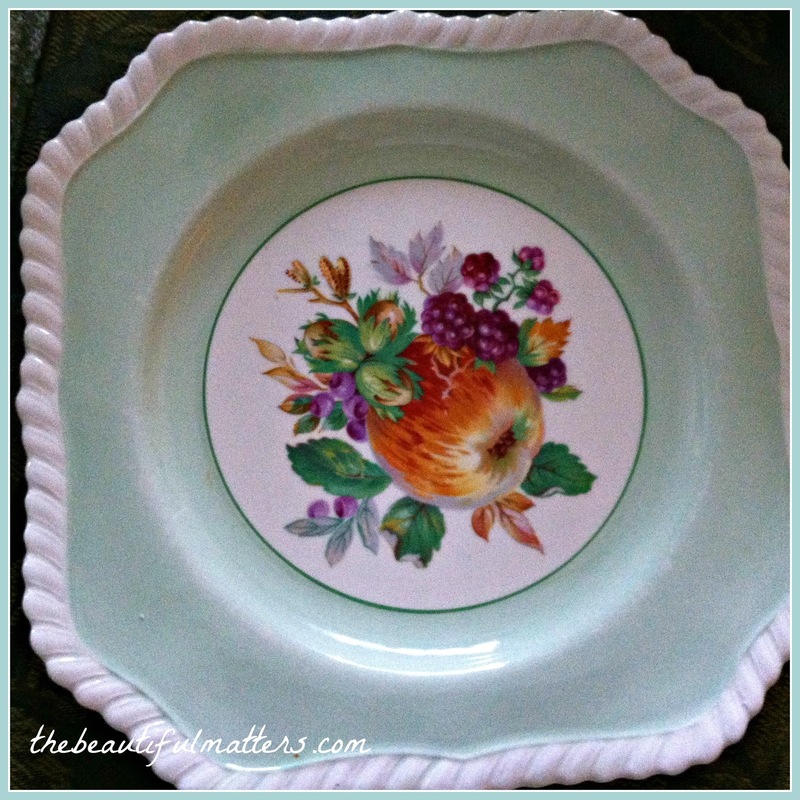 Square plates look so nice on the table and add a little something extra with their shape. My hubby loves to dunk his cookie in tea too. Thank you for joining me and leaving your lovely comment. Have a beautiful day. Hello lovely lady! 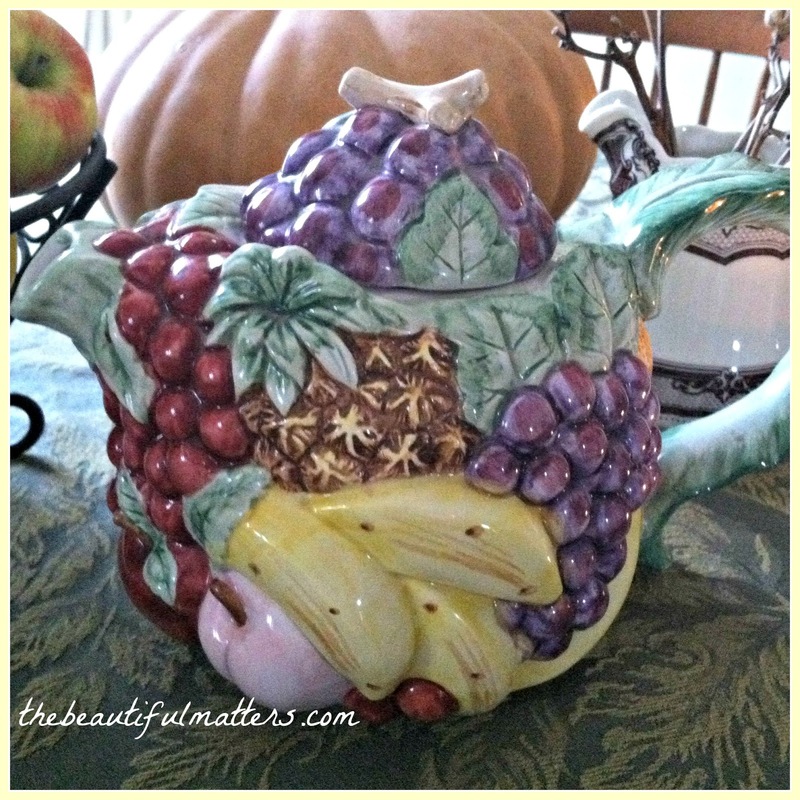 Your harvest tea looks delightful! Yes, it seems Autumn and Thanksgiving are overlooked. I am amazed that there is already so much Christmas decor available in the stores and there seems to be a lot of Christmas commercials already out. It is sad to see that Thanksgiving does not seem to make an impact in stores. Anyway, I thoroughly enjoyed your tea and pictures. Happy Monday to you, sweet friend! Hi Deborah, yes it is crazy to me, my husband, and daughter how it just feels so early and rushed in the stores, on TV and just everywhere with Christmas. We like to enjoy Thanksgiving and I still have my fall decorations up! I love your fall tea table setting and the cookies are adorable. 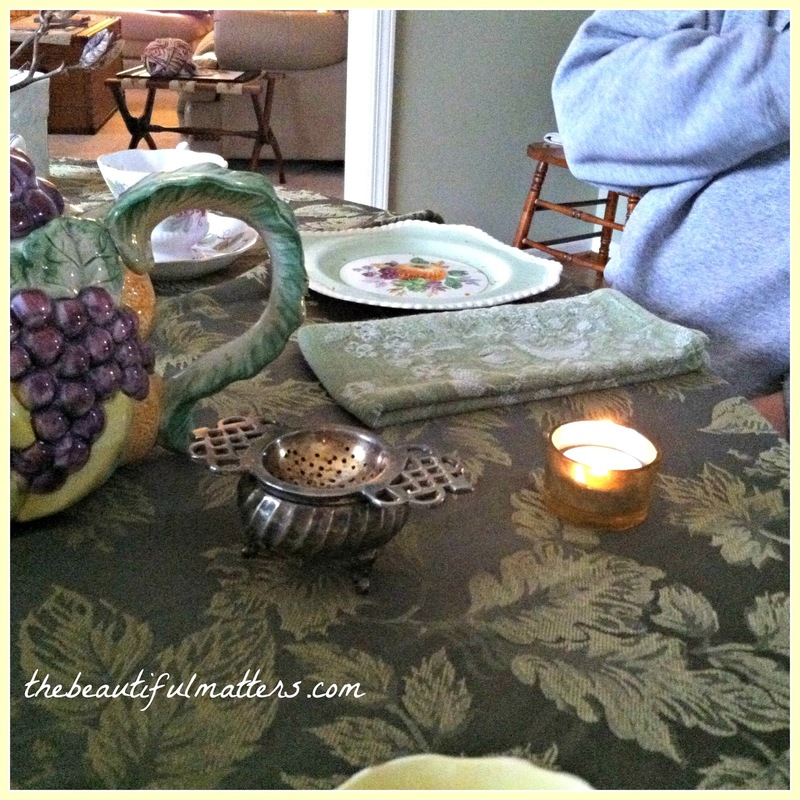 I look forward to reading you next post on dealing with holiday stress! Enjoy the week. That is all so pretty! I love the natural items to go with the dishes. Makes such a pretty setting. And I really like that tea 'strainer.' Windmill cookies were always my favorites as a kid. I just bought a bag yesterday! I hate everything holiday so I stay out of malls, stores and the like. Oh, I'm sorry you do. I love them; I just want to celebrate one at a time! Hello Deborah. I'm always pleased to be Canadian, but never more at this time of year. 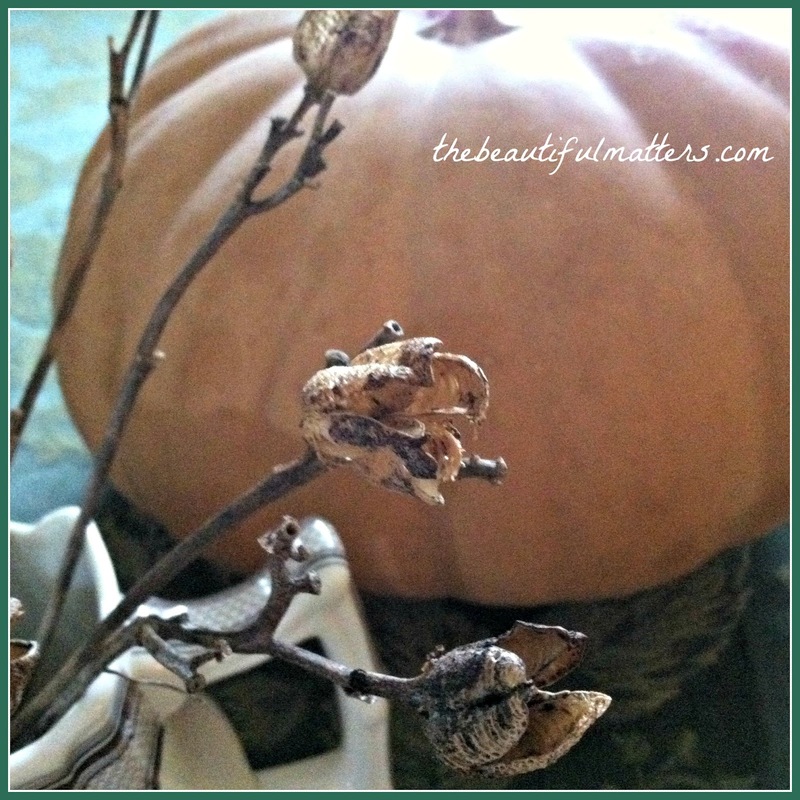 It's nice to focus on Thanksgiving in October without the pressure of Christmas looming. The Christmas things are appearing in stores, here, too, although I'm staying away for now. Your dishes are so well suited to the harvest theme. Beautiful tea! 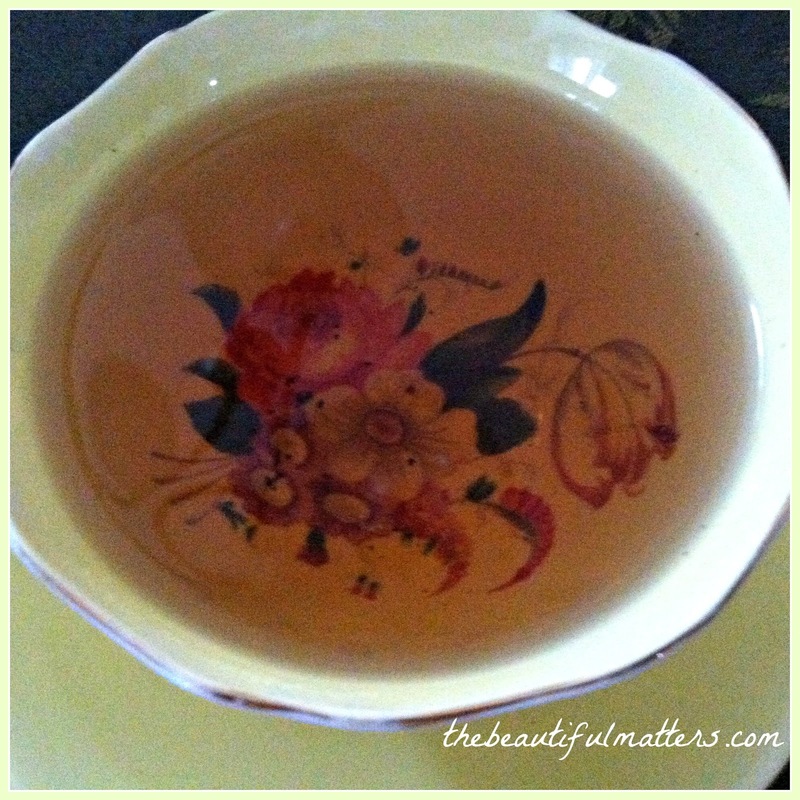 I'm enjoying the chai tea you sent in the giveaway - it's delightful with milk and honey. 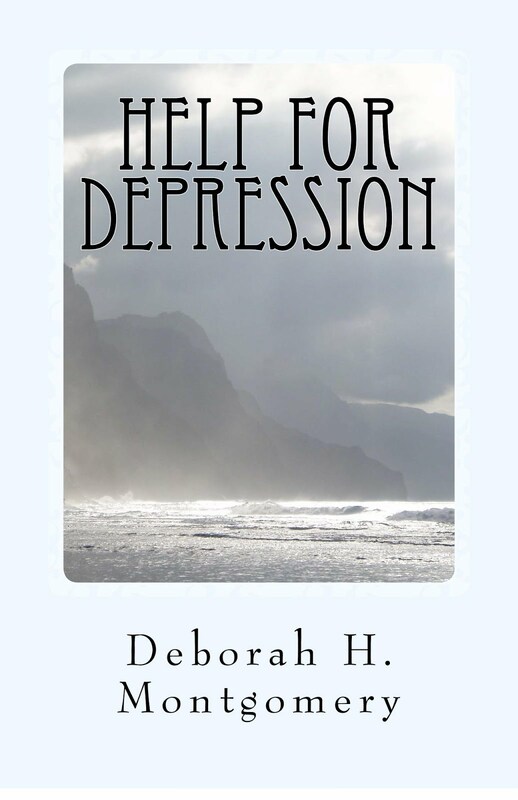 Hi Deborah, the season seems to be moving faster every year. I like to give Thanksgiving center stage this month and do not decorate till the day after, but having a shop has me creating for Christmas always early. Love your gorgeous teapot and those plates are lovely. I enjoy anything with a fruit design too. I remember windmill cookies. 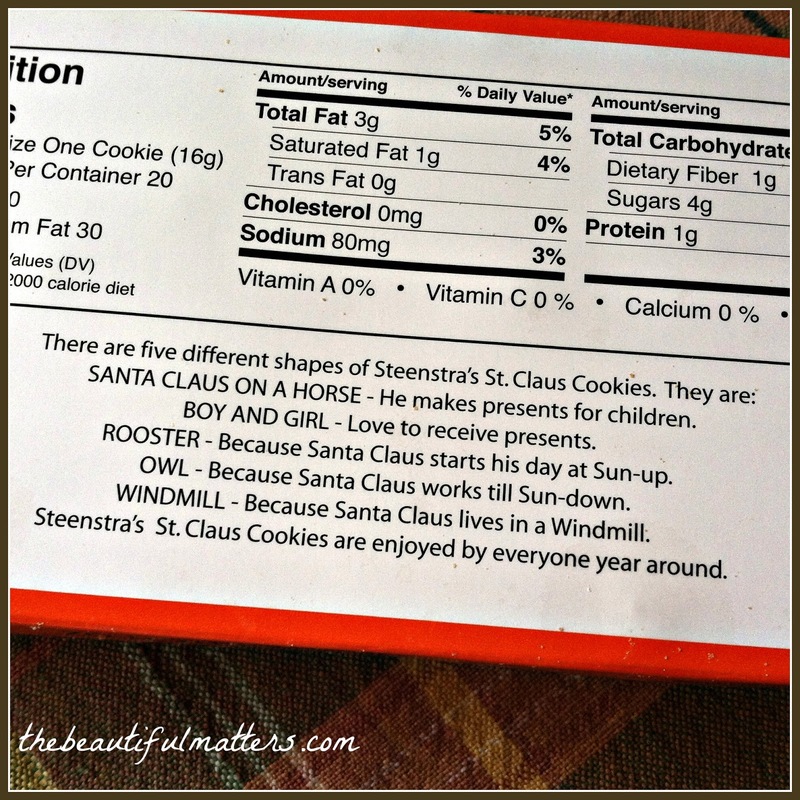 The Santa variety look so good too and low sugar!! Thank you for sharing your lovely tea. 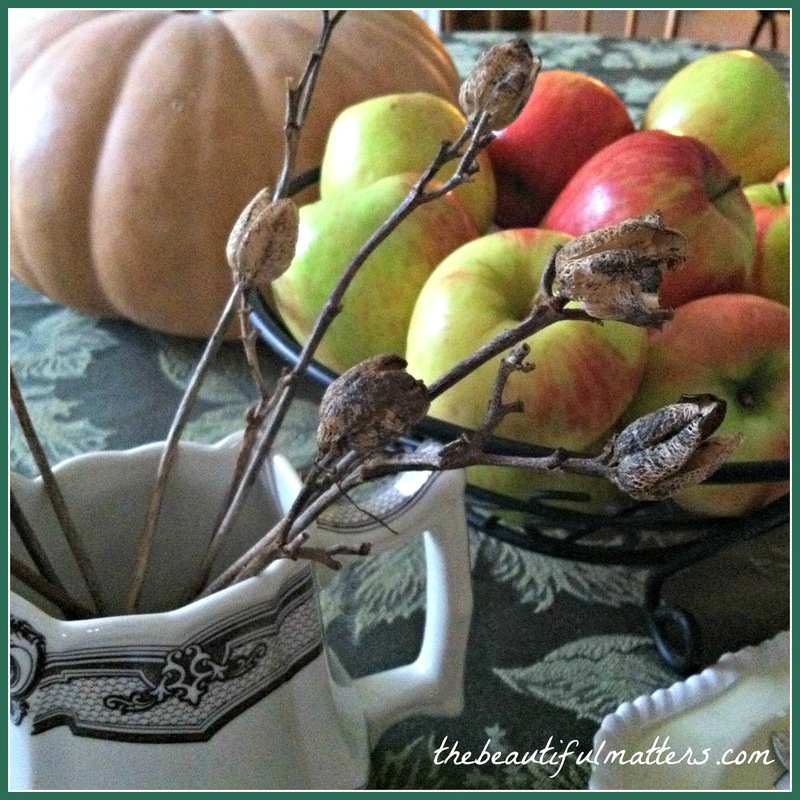 A few branches with seedpods makes a pretty natural centrepiece in a vase and yum, look at that big bowl of honey crisp apples. My husband doesn't drink tea and wants no part of what I put together for a tea post. I'm glad yours obliges, even if he's busy watching a game on TV. Haven't had windmill cookies in ages. 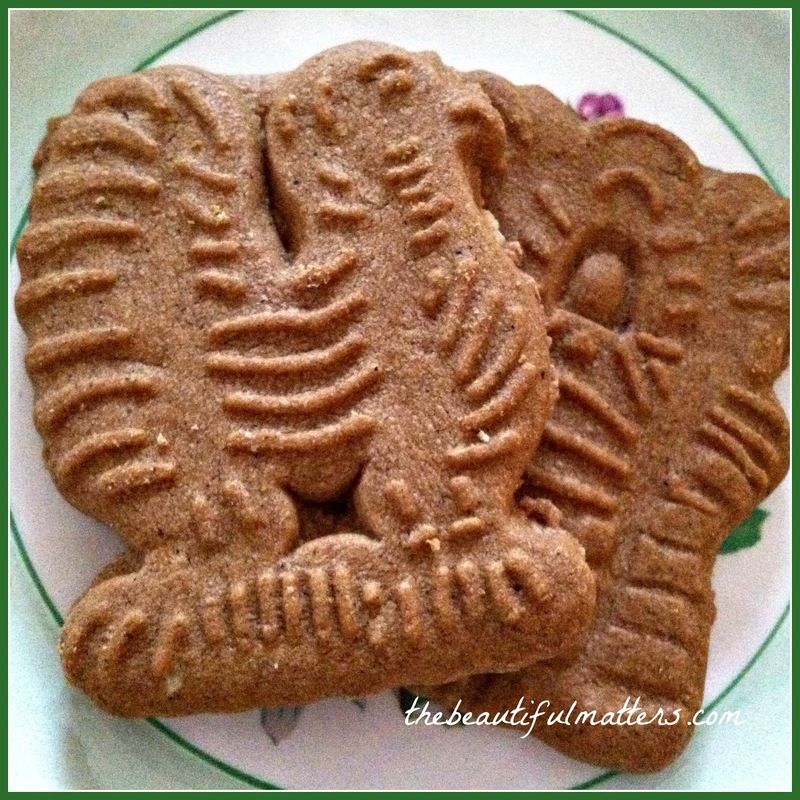 You made me smile with this post... like being back home in The Netherlands with Dutch Speculaas cookies! I still have the Seculaas kruiden (spices) for baking them and I often baked them with Almond Paste (very rich!)... Oh, those Dutch traditions that now are so common here in the USA since the 17th century. Being honest, I've been wearing my shorts for the past two days, for walking in the sunshine. Wearing a long sleeved (pushed up) cotton sweatshirt on top. Feels good until it cools down by late afternoon. We still have that warmth and the sunshine but only for a short peak! Yes, I have each year such a hard time parting from summer. We had tea on the balcony today in the sunshine! Trying to stretch it, no matter the commercial push for WINTER! Santa? Then who's at the North Pole making all the toys :) ?! I'm totally with you - let's enjoy autumn for awhile longer. Bring on the pumpkins and apples. 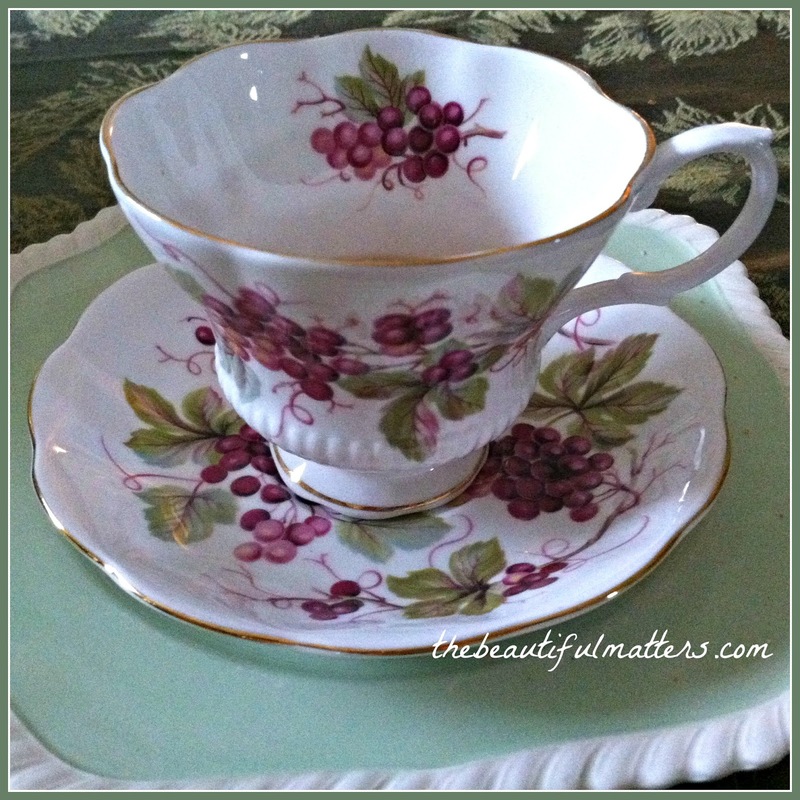 I love your pretty china, Deborah - you have mixed and matched them so nicely! I especially love the little pitcher with the lily pods - it is so pretty. I love windmill cookies and haven't thought about them in so long. I now have to find some....I do love to have tea with my daughters when they visit, but mostly I do it for myself. There is something so special in treating oneself to a pretty setting and sweet treat as a reward for getting things done. My Mother taught me this trick - whenever you have an unpleasant chore to do, make sure you reward yourself in some small way. I am looking forward to your tips on the holidays. I am hosting this year. would like to join you for a while. What a lovely table and your china is absolutely adorable. Fantastic! Such inviting photos as always. I thought of you (this post) yesterday when I "created" a new tea blend. I mixed Harney and Sons' Hot Cinnamon with a fennel/licorice tea I bought in Venice this summer. It was very lovely--which kind of surprised me. I'm trying to enjoy Autumn, too! I put up most of the Halloween decorations, but have to admit I put out a few snowbabies ... I found them as I was boxing up Halloween and figured they could stay out all winter! 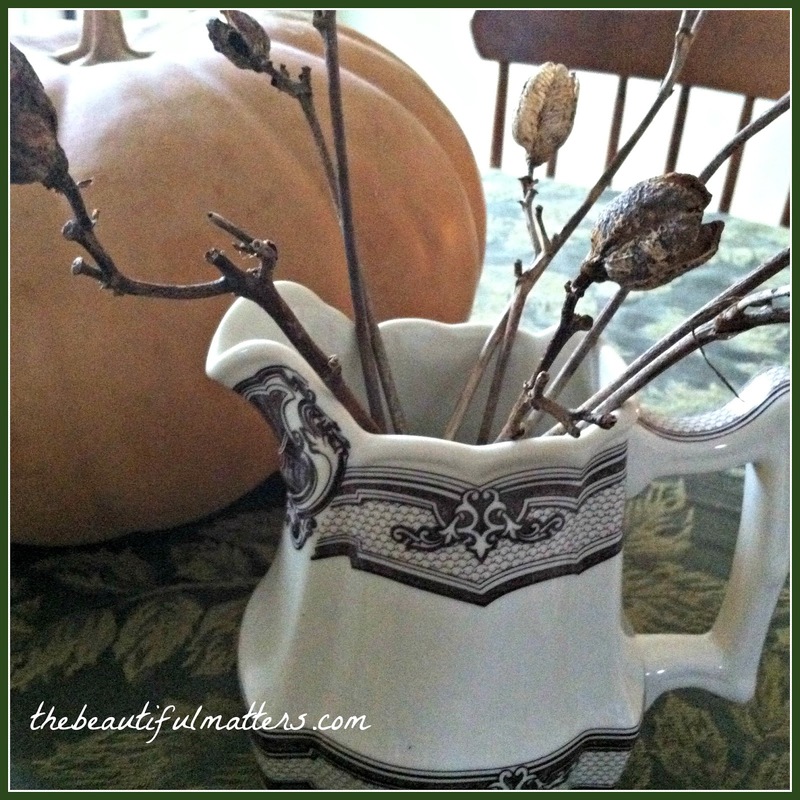 Love your Autumn table-teascape and the FF teapot. FF is one of my all time favorites. Happy Tea Day! I'll take a Honey Crisp. Aren't they the best ever!? ! Oh yes, let's not rush our seasons. I don't want to immerse myself just yet into Christmas either. I LOVE your Fitz and Floyd fruit teapot. I have a few pieces from F&F myself. Enjoy their beauty and fun. We are in the throes of winter wonderland, but I tried out some Christmas music on youtube earlier today. Nope! I'm not in that mood just yet. But I will be soon enough. Here! Here! I agree with you about not skipping over half the season. And don't get me started on the way Thanksgiving gets the bums rush! I do my best to remind myself that I do not need to live by the Madison Ave advertising calendar.. .but it does effect most of us. I want my full measure of Autumn and I want a proper Thanksgiving - even if advertiser's don't think there is money to be made setting aside a day to celebrate God's bounty and thanking Him for our blessings. 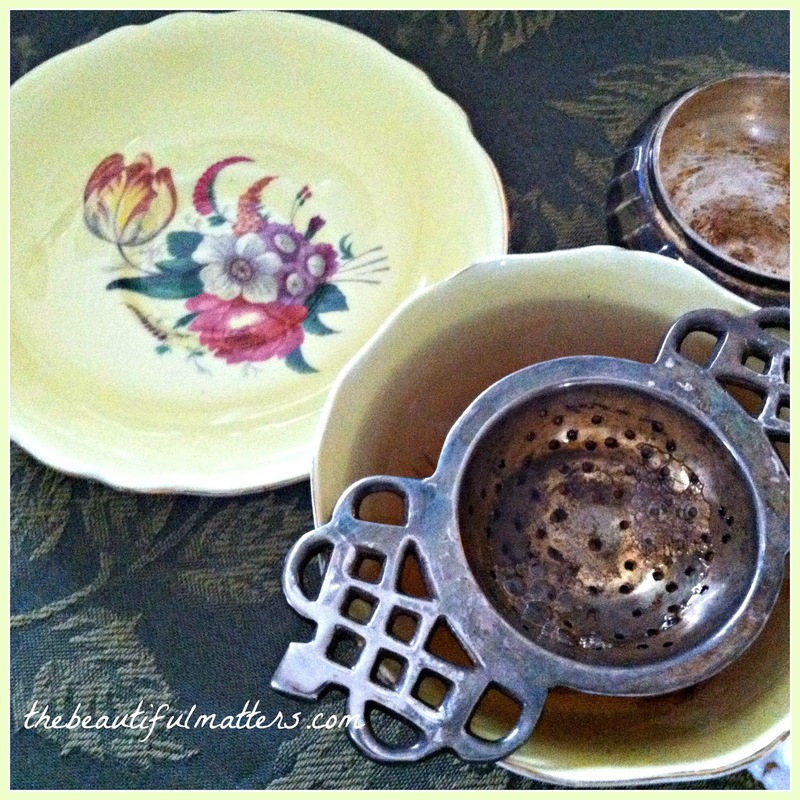 Okay... this is me hopping off my soap box ....Lovely tea - the plates are especially appealing to me. Have a great week! You say legs, I say feet . . .